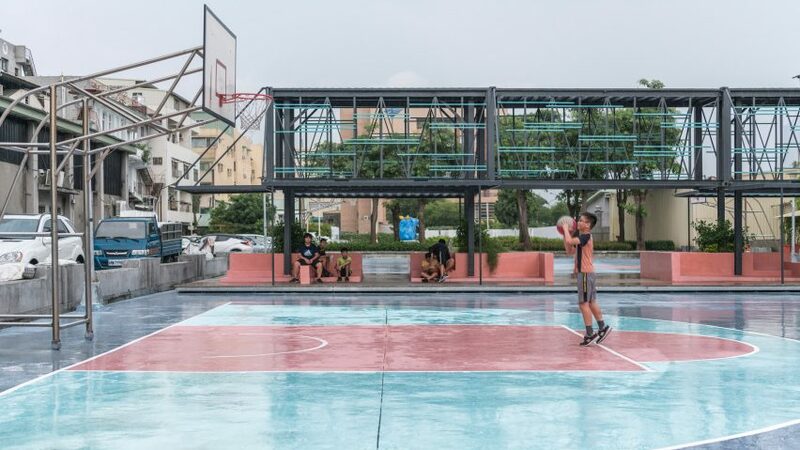 Cool Cool Seaside is a pavilion made from three raised shipping containers, which provides shelter for two basketball courts in a square near the docks of Kaohsiung City, Taiwan. 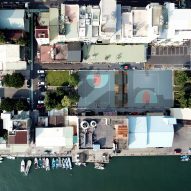 The structure designed by Atelier Let's, along with works to the surrounding square, was commissioned by the city's Urban Projects Bureau to "revitalise" the square bordered on one edge by Gushan ferry pier and by a run of shops on the other. Called Cool Cool Seaside, the pavilion is made from three containers, raised off the ground on steel beams, with sides that fold outwards to become canopies for a seating area beneath. 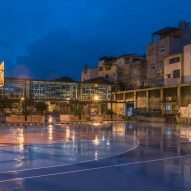 The site was already home to two basketball courts and an area of concrete seating, which the new structure seeks to unify and make more welcoming for residents and tourists alike. "Thanks to the Urban Projects Bureau, this neighbourhood is once again being introduced to the public by means of a revitalisation." 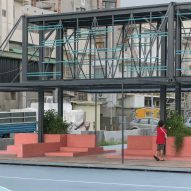 The three shipping containers, a reference to the site's past as a colonial Japanese railyard, were disassembled and reduced to their steel skeletons before being reinforced, repainted and reconstructed. 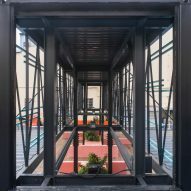 Thin steel bars support the sides of the containers, which cantilever at either narrow end and are supported by slim columns along the longer edges. In the hollow shells of the containers a series of blue horizontal steel bars echo the window grills of surrounding properties and the colour of the nearby water. 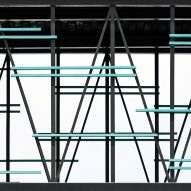 "During the day, when the sun moves across the sky, the silhouette of the horizontal bars reminds us of the sea waves and the ocean that surrounds us," said the architecture studio. A raised area of pinewood flooring has been inserted around the seating, helping to define it from the surrounding courts and "bring a sense of relaxation". 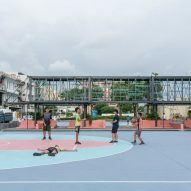 To further harmonise the colours of the space with its surroundings, the basketball courts were painted by Bamboo Yang, a member of local street art group the Wallriors. A visual axis from the nearby Wen-Long temple cuts through the the square, and the canopies have been removed from the central shipping container in order to not obstruct this view. The height of the structure has also been calculated to not surpass that of the temple. Shipping containers continue to be popular as a building material, used in everything from a tower-like parking attendant booth to a porter's lodge at a Cambridge college. In recent years brightly coloured basketball courts have been installed in cities across the world, often as parts of rejuvenation schemes. In Mexico City All Arquitectura created a vibrant blue football and basketball court, while artist William LaChance painted a mural across a several courts in St Louis, near Ferguson where riots broke out in 2014. Photography is by Yi-Hsien Lee Photography.